Kevin Nicks of Chipping Norton broke his own previous World’s Fastest Shed record this weekend during a land speed event on the Welsh beaches of Pendine Sands. The previous record of 88.086 miles per hour was obliterated when Nicks reached a top speed of 101 miles per hour. A self-proclaimed master of the shed, Nicks has built his shed on a Volkswagen Passat platform. For the initial record, the car retained it’s stock 2.8-liter V6 engine, though according to the BBC it now has output of 400 horsepower thanks to an Audi RS4 engine swap. The shed first found motivation in 2015 when Nicks’ daily driver Passat broke, and he had a flash of inspiration to build something different. “I’ve spent all winter doing it up and putting in a new engine and suspension, it’s so quick off the mark. I had no idea how fast it would go - and it went well. It felt comfortable at 100mph, I was pleased,” says Nicks. 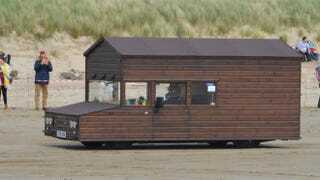 You can find out more about the world’s fastest shed by watching this video. Pendine Beach is synonymous with land speed racing in the UK, since Sir Malcolm Campbell initially set records in the legendary Bluebird there in the 1920s.